In the Fall of 2013 at Thayer School of Engineering at Dartmouth College, we worked to identify a social need in the area of mobility or portability and implement a creative and effective solution. 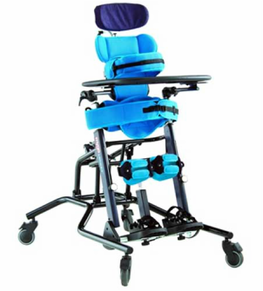 Scott’s experience with healthcare and rural medicine led us to identify a need for pediatric standing frames, which are devices helping children with severe disabilities stand in an upright position and perform weight bearing exercise. ​Weight bearing exercise for a minimum of one hour per day is critical for normal development and has huge health benefits including development of muscles and bones, improved respiration and circulation, as well as better bowel function. Standers have enormous social benefits for the child as well. A stander allows a child to be up in the middle of the action of the home, interacting with the world in a normal vertical position instead of lying isolated on a mat in the corner of the room.